Of all the movies that would most accurately predict the year 2017, I never guessed it would be Caddyshack. 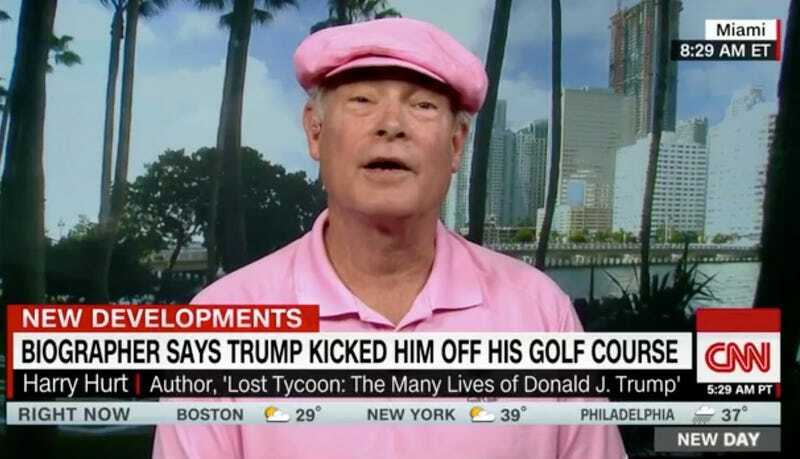 On Friday, one Mr. Harry Hurt the third, was personally booted from Donald Trump’s golf course in West Palm Beach. Why would President-elect Trump do such a thing? Back in 1993, Hurt had written a book called Lost Tycoon: The Many Lives of Donald J. Trump which, among other things, explained the sordid details of Trump’s divorce to Ivana. One story arc to Caddyshack, of course, is that the crude and unrefined (yet incredibly wealthy) Rodney Dangerfield upends a stuffy golf club with his strange but lovable antics. The establishment (the snobs) are utterly shocked by everything he does, but he’s loved by everyone else (the slobs) as he destroys polite society with his unusually blunt and sexist banter. Sound like anyone you know? It’s a trick question! They’re both from Caddyshack because we literally live in that movie now! Yes, everyone on Twitter right now seems to love passing around this screenshot from The Running Man. But our dystopia is much worse.